IWC Aquatimer range of divers’ watches was first released in 1967 to meet the demands of a growing market of scuba divers. 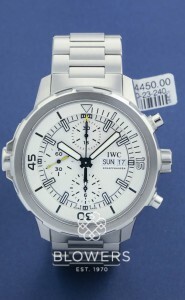 With IWC continuously innovating and improving the watch since its launch, a range of models are available today. This includes models with cases in bronze, gold, and titanium, a complicated perpetual calendar movement, and new bezel functions. Browse Blowers’ current stock of Aquatimer watches below. All watches on our website come with a minimum one-year guarantee. Finance options are available. Looking for a specific model? Get in touch and we will endeavour to source it for you.